Location-based “Mixed Reality” mobile game Gbanga has launched an API, and it wants developers to hack away to actively modify gameplay, contribute game content and more. 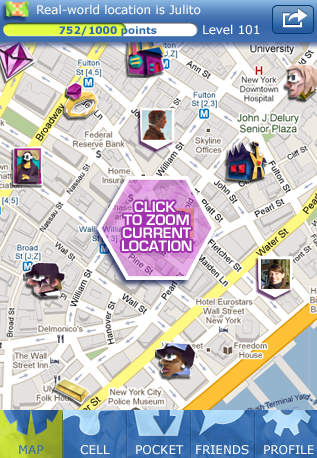 Gbanga is based around ‘gamifying’ your surroundings. As you walk around in real life, you’ll be presented with nearby challenges such as finding and collecting special items or competing with others for virtual ‘territory’. As you play, you can earn points to move up the leaderboard, with occasional ‘real’ sponsored prizes on offer too. Now the Swiss team behind Gbanga is opening it up to the imagination of the crowd. “The majority of gaming experiences are the sole realization of their respective game development studio,” says the studio’s Matthias Sala. “No doubt the designers of these games had great fun creating their worlds and stories. However the playing community has always shown an interest in contributing their own content.” Gbanga’s ‘Puppetmaster’ API and Quest Design Kit tools aim to achieve this. To promote the new developer tools, Gbanga is taking part in Hackathon at The Next Web conference in Amsterdam next week. Coders are invited to create quests, side-quests, extensions, mini-games, mashups and mobile clients. You can find full details of Gbanga’s development tools here and information on the TNW Hackathon here. Gbanga’s app is currently available for iOS and Java/J2ME handsets.